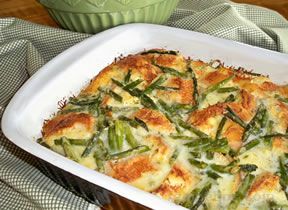 Once established, asparagus will produce delicious spears year after year. 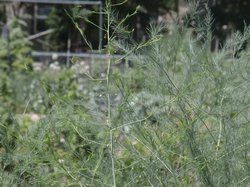 Plant once, harvest forever: growing asparagus gives you a perennial vegetable that can provide you with a bounty of delicious stalks for many years, once it's established. 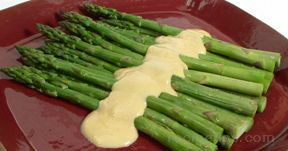 If you have well-drained soil and a sunny spot, you can turn it into an asparagus bed. The fastest and easiest way to start an asparagus bed is to buy crowns. 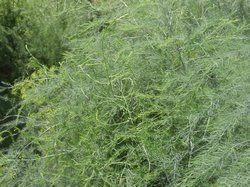 Asparagus crowns are the root systems of year-old asparagus plants. Choose a sunny, well-drained spot and prepare the soil. You'll want to start with well-worked, well-fertilized soil. 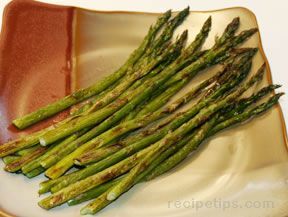 (If you want to plant it in raised beds, be aware that asparagus sends its roots deep.) 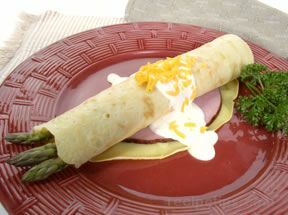 Asparagus loves sun and it loves phosphorus, so you'll either need chemical fertilizers or lots of composted manure. 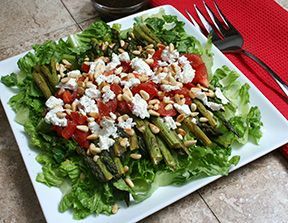 Once it's fully established (which takes several years), one asparagus crown will produce about 1/2 pound of asparagus per growing season. Each crown needs a fair amount of space: you'll want to space them 1.5 feet apart in the row, and if you plant more than one row, leave 5' between the rows. Plant your crowns once the soil has warmed up to about 50F. Dig a furrow 6 inches deep, layer in fertilizer, and put the crown directly on top of the fertilizer. Then fill in the furrow. Keep the plants moist (but don't overwater). 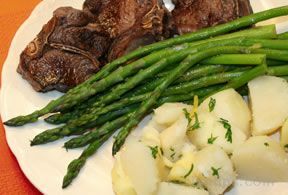 Do NOT harvest the asparagus during the planting year. You'll be able to take a few stalks during the second year, but don't overdo it. 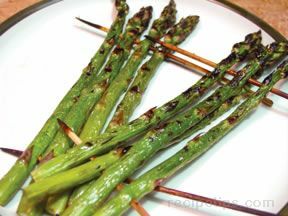 If you prefer to grow asparagus from seed, this is cheaper and may give you better results, but it will take an additional year before you'll be able to harvest your asparagus. 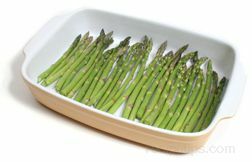 Depending on your climate, you may be able to direct-sow into a prepared bed in your garden, or you might need to start the asparagus in containers. If you need to start it indoors, plant the seeds in pots (3 seeds per 6" pot) and then thin down to one plant per pot. Harden them off and transplant them outdoors when they reach 6 inches in height. If you choose this option, you can give them the same spacing you'd give crowns. If you are direct-sowing, wait until the soil reaches 60F. Then plant the seeds 1/2 inch deep, 2 inches apart. You should plan to dig them up the following spring before growth begins, and then transplant them to a permanent bed (at which point, they're essentially home-grown crowns). If you start from seed, you'll need to wait two years before you start harvesting spears. If the seeds come with a growing guide, check the instructions for the variety you're planting to see how long you should soak them before planting, whether you should soak them in disinfectant before soaking them in water, etc. Asparagus seeds are a little tricky and some gardeners have trouble getting them to germinate. 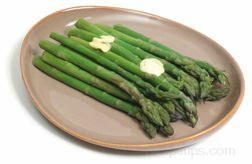 If you follow the instructions and have a sunny, well-drained location, you should have asparagus ready to harvest one year after planting the crowns, or two years after starting the seeds. 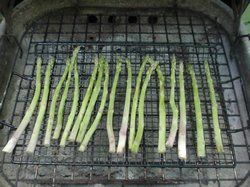 Asparagus usually starts coming up once the soil reaches 50F, which in most places is early to mid-spring. When the stalks are 6 to 8 inches high, you can cut them or snap them off at the base. You should pick the patch clean as you harvest and try not to let the spears get ferny. 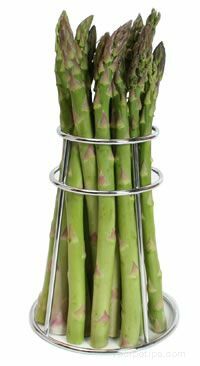 The second year after you plant crowns (or the third year after you plant seeds), asparagus growing season will probably last for about three weeks. The following year you'll be able to harvest stalks for 4-6 weeks, and in the years beyond that, 6-8 weeks. Usually the stalks are widest in the early spring, and get narrower as you go. When 3/4 of the stalks are the width of a pencil, it's time to quit harvesting them. 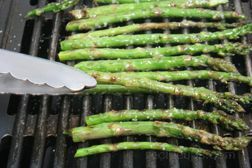 Snap all spears off at ground level and fertilize, then let the asparagus grow into a big, ferny hedge for the rest of the summer. The bigger the hedge, the more stalks you'll get next year. In late fall, chop the hedge down and remove the fronds to your compost pile. 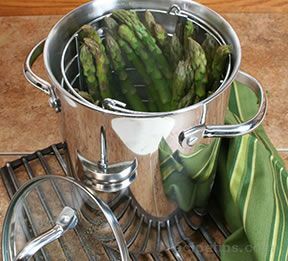 This will minimize the risk that your asparagus will get infested with asparagus beetles. Whether you're buying seeds or crowns, seek out a reputable source. There are many ways that crowns can be damaged in transit, and seeds sometimes refuse to germinate. 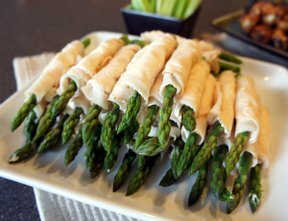 Growing asparagus will give you new insight into buying asparagus stalks at the store. A lot of people assume that thin stalks will be more tender, while thick stalks are tough. In fact, thick stalks are thick from the moment they emerge from the ground, and since they are thick earliest in the spring, quite often thick stalks are the most tender. 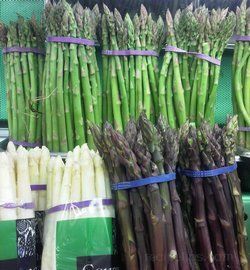 The warning sign to watch for in store-bought asparagus are stalks that are beginning to fern out (rather than having tight, compact heads). That's a sign that they were a late-season harvest and probably won't be as tender. You may be able to get a lot of growing tips from the agricultural extension office at the state university in your state. 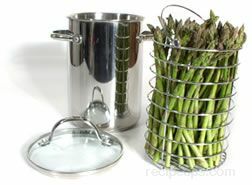 This can be helpful not only for asparagus but for any plants you're trying to grow. 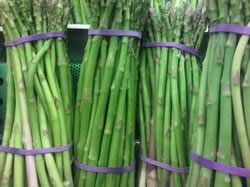 When planting your asparagus, seek out an all-male hybrid variety. 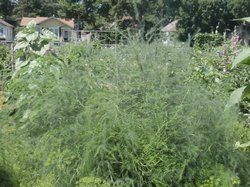 Asparagus plants come in both male and female varieties, and the male plants are much more productive because they don't waste energy producing seeds. 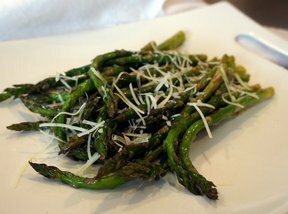 Growing asparagus seeds seems like it would be a good thing, but it's actually something you want to avoid. 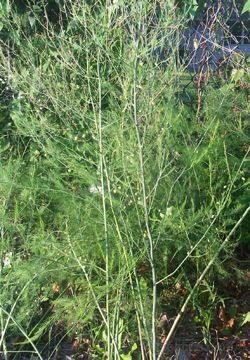 An asparagus plant with berries. "All male" actually means "mostly male." You'll probably still get some female plants. If you notice that first year that some of your plants are producing berries, you'll want to dig them up and throw those away. (Do not eat the berries. They are mildly toxic.) If you have extra space, you could choose to let them reseed themselves, but this will result in crowding. Weed vigorously, especially in early spring and during the first two years. Mulching will save you a lot of work. 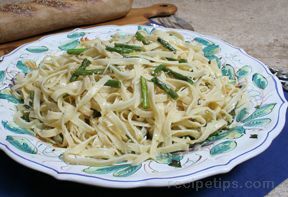 If you want white asparagus, mulch heavily over the plant as the shoots are starting to come up. Being shielded from sunshine is what gives white asparagus its blanched color. 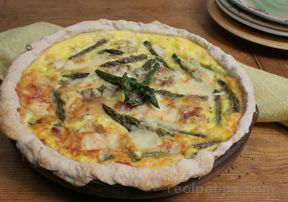 The best time to pick asparagus is early in the morning, when it's cool. 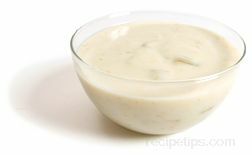 Refrigerate until you're ready to use it (and use it as quickly as possible). Early morning is also the best time to pick off asparagus beetles, because they're too cold to fly. 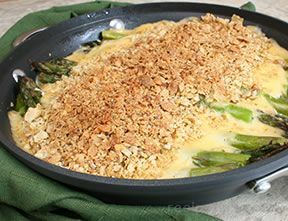 Growing asparagus can be somewhat challenging (especially in the beginning) but freshly harvested asparagus is delicious enough to make it worth the trouble.